Historic Richmond Town’s rich array of apprenticeships build real-world skills based upon centuries of American ingenuity. The program is a wonderful alternative to the tried and true summer camp. Individualized sessions in the Historic Trades are conducted in small groups of less than five and accelerate learning as students work with an experienced Artisan to build their skills forging iron, weaving baskets, carving wood, crafting tin, and cooking over an open fire as they create one-of-a-kind, hand crafted items. The historic settings are fully furnished for an immersive and hands-on practice. Apprentices will visit the other trades during their week to add to the fun and the 360-degree learning. At the end of each session, apprentices will have the ability to present their trade and lead a specialized tour of their workshop to visitors and their families. Basketmaking and Textile Arts: Textile arts can include a wide variety of skills including building objects of wood, paper, cloth and thread. Each project will be chosen according to your interests in discussion with the teacher. Blacksmithing: Wield hand-tools to shape red-hot iron and manage the fire in the forge. Apprentices create useful objects using the anvil, teaming with other blacksmith apprentices. Gardening/Agrarian Life: Apprentices will curate period gardens, plant, harvest, and care for plants. 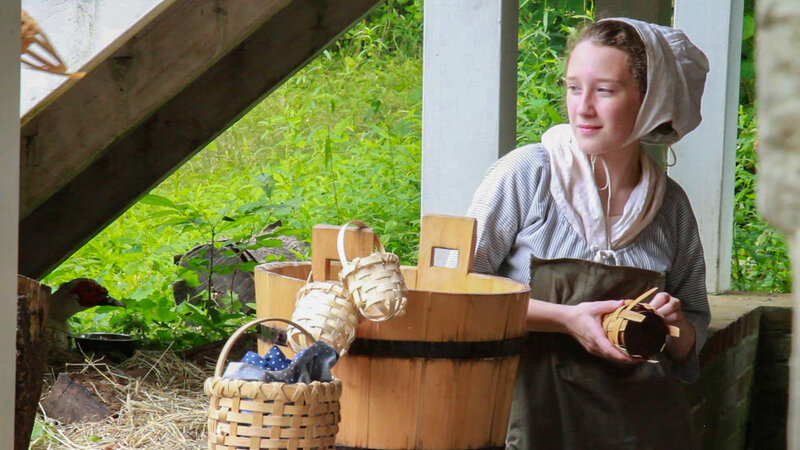 From their harvest they will cook and preserve food items according to the traditions of the 1800s. Learn to choose plants for a variety of kitchen garden styles, identify plants, types of soil. Making History: Apprentices Richmond Town’s explore extensive archives in order to create their own, researched, accurate historic replicas. Participants will make their own colonial money, design and distress 19th century portraits, and rebuild inventions that played integral roles to our Staten Island ancestors. Open Hearth Cooking: The hearth is the center of the kitchen; apprentices learn to manage the fire to power a Dutch oven, griddle, and reflector oven with a variety of authentic recipes from the 18th and 19th centuries. Desserts, main dishes, berry jams and more will be added to the take home recipe book and skill set. Tinsmithing: Cutting and piercing tin may look simple, but it requires a good deal of skill. Apprentices will learn to use tin snips, cut a clean edge and read patterns to fashion bright, reflective objects. With practice, apprentices may evolve to shaping tin pieces on stakes and soldering multi-piece items. Woodworking: Learn the trade from a tried and true craftsman. Create household items like wooden plates and bowls, or, farm tools like wooden rakes and flails. Discover wood's ability to bind and create a water tight seal. Build and create objects using original patterns and tools. Students ages 9-11 choose the themes that interest them and enjoy activities that give a taste of kids’ lives and skills of the past. Tours of the historic village are part of the fun! Patriotic Americans: Students visit the kitchen of the historic Guyon-Lake-Tysen farmhouse to see how pies were baked in an original beehive oven, then bake and sample their own pie in a Dutch oven, learn to make a paper pinwheel and march in an Independence Day parade. Hand-churned ice cream and Victorian parlor games add to the fun. By Lantern Light: Supported by Con Edison, students will make wax candles and visit the tinsmith to see how tin lamps and trays are made. Paper lanterns are punched with designs like the authentic tin lanterns and lit by safe LED lights. A cooking session brings African American recipes to life. Participants learn to use flint and steel to make sparks for the fireplace like colonial kids. Colonial Trades: Students will meet the blacksmith and see how he shapes iron at the forge. They will assist in the creation of a simple object using a hammer at the anvil. They will craft a leather pouch, spend time learning and harvesting in the garden. 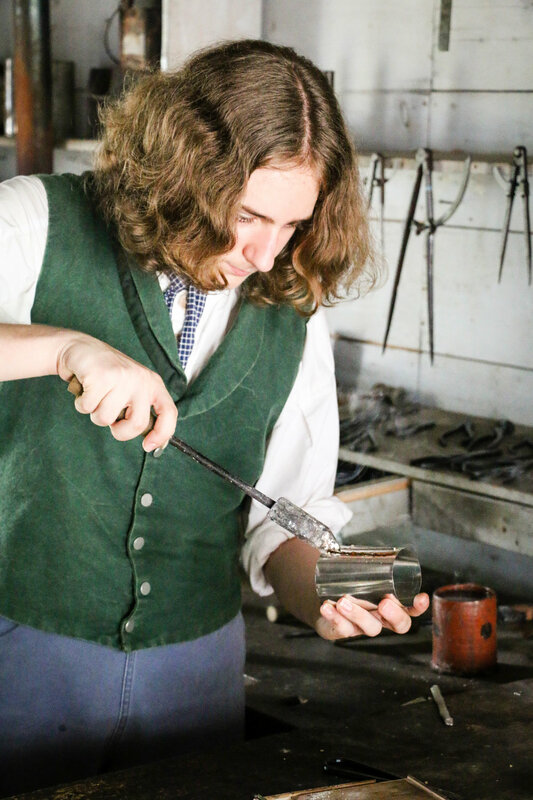 Students will visit the tinsmith for an expert demonstration of tin punching and try their hand at it too! Learn “new” games that are over 100-years old. Folktales and Drama: Participants choose a folktale and bring it to life as a puppet play. Make scenery, puppets, plan a script and be part of the presentation. Learn old-time traditional kids games. Victorian Kids: Tour the exhibit TOYS! and meet a curator. Visit the historic village to see tasks and fun that kids had in the past. Make paper toys and learn how to play with them. Spend time in the garden, tour a Victorian garden and learn to identify flavorful plants. Moving Pages: Bind a Book and write a story to go in it. Make decorative marbleized paper to add to your book. Make a toy that works like animation, then make a simple flip book. Apprentices learn to write with a feather.